Hail and Well Met, my fellow fat sweaty nerds, geeks, and other ne’er-do-wells! How does a person start something like a blog? What drives a person to think that whatever they have to say is so important that it simply MUST be shared with the world of the internet? Well, friends, I don’t know what that something is, but we’ve apparently all got it because sites like tweeter and facebox (and wordpress) have clearly done well for themselves. To be honest, I am extremely technologically illiterate. I don’t have a facebook, I don’t have a tweets, and I have no clue what an RSS is. Really, I’m just an overweight, nerdly sort of chap who wants to get back in shape for Dragon*Con 2012. This entry was posted in About Dragon*Con, About Fitness, About Me. Bookmark the permalink. 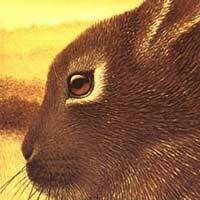 Indeed, this picture is from the cover of one of my favorite books, Watership Down by Richard Adams. The animated movie freaked me out as a kid and it took me forever to figure out where these mental images of bloody, rabid, rabbits came from. Hazel and Fiver were the main characters, Hazel-Rah was Hazel’s name when he became chief of the rabbits. There’s just something so pastoral and pagan about the story that I just love it, like Wind in the Willows. Dood. I am blog retarded but I will try to be a good student and learn about the blog world.